Wrong is wrong. Right is right. The above image was shared by one of my Facebook friends. It inspired me to write the first blog of the year 2014. The quote is so relevant in our every day life. So many times we have been tempted to justify our wrong actions by stating that others are also doing it. We try to defend our incorrect actions by indicating that the vast majority is doing it. Ultimately every one shrugs their responsibility and the society at large comes across as irresponsible. The best example is of littering in public places. Majority of us are educated enough to know that it is not the right thing to do. We still do it because others are doing it. When someone does it and it affects us because it is closer to our house or workplace we would be frustrated and speak negatively about this act. However, when we are the doer, we will have many words to justify the same act because of the simple reason that we are not the one at the receiving end. To stand up and fight for what is right takes courage, especially if you are the lone person standing for it. However, by not doing it aren't you cheating yourself? Are you not putting a question mark on your integrity? There are innumerable examples of such acts. Bribing government officials, bribing the cop for a traffic offense, Paying black money to builders, bribing cops for police verification etc. As long as a wrong act is getting things done for us we do not complain. The moment it starts hurting us, we will make a loud noise. Friends, why not stand up for what is right? We may have to fight a lone battle but if what you get in return is a calm and warm feeling in the heart, isn't it the logical thing to do? One should be able to wake up in the morning, look into the mirror and not be ashamed of oneself. 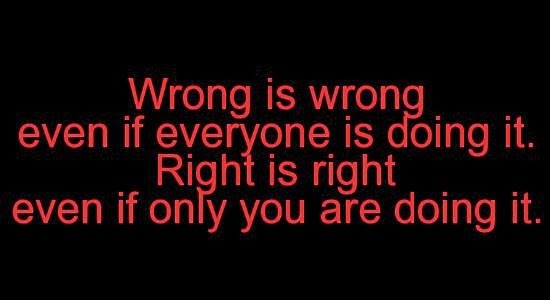 If one ensures this, I feel he/she would be a person who understands the above quote and applies it in his/her life.